Early morning sunlight streams through the 500-square-foot studio of perfumer Anne McClain as she leans over her pinewood workbench. Hundreds of tiny glass bottles filled with extracts and absolutes—everything from Tunisian neroli to oakmoss to red thyme—line the glass shelves behind her, while feathery dream-catchers, pencil illustrations, and a faded map of southern France decorate the whitewashed walls. The lush scents of perfumes, elixirs, and beeswax moulds surround McClain in her greenhouse-like space. The setting, however, is definitely not a greenhouse, but gritty, industrial Greenpoint, Brooklyn. Here is the base of MCMC Fragrances, McClain’s cultishly admired range of botanical eaux de parfum, perfume oils, and candles. Everything is produced in small batches and inspired by McClain’s memories and observations. The wildly popular Hunter, for example, is redolent of flannel shirts and outdoorsy Vermont, with whiffs of smoky tobacco, organic bourbon vanilla, and balsam fir. Kept, on the other hand, subtly references love and the tiny tattoo of an antique key McClain has on her finger, with its soft roses, black tea, and spicy hints of clove, leather, and amber. Unlike most mainstream fragrances, McClain’s formulas are not crammed with hundreds of ingredients. Instead they are stripped down to their most raw, bare elements, illuminated with just a handful of pure essences. In this way, each note resonates, and recalls the crushed petals, ripped-up dirt, and grassy fields from which they originated. Indie perfumers seem to be popping up everywhere these days, especially in Brooklyn. While many are self-taught and blend by their own rules, McClain is unique in that she’s a trained nose. Formally schooled in the classic methods, she translates old-world techniques into a new order of perfumery, creating refreshingly modern, minimalist works of olfactory art. Ingredients are not tossed into formulas without thoughtful consideration and study. She mixes everything by hand, using a base of 190-proof denatured alcohol for her eaux de parfum, and organic jojoba oil and fractionated coconut oil for her perfume oils. Pipettes, glass beakers, and a digital scale (accurate to one-hundredth of a decimal point) serve as her trusted tools, and she keeps detailed records of every formula. Despite the fact that McClain’s world now rotates around essences and oils, she didn’t grow up obsessed with scent. Instead, she studied visual art at Brown University, and later moved to New York to pursue photography. On a whim, she took a natural perfumery class at the New York Open Center in midtown Manhattan in 2007, and had something of an epiphany. “I saw perfume in a new light,” she says. “Everything just resonated, especially how scents could be tied to memories and nature.” From there, she “fell down the rabbit’s hole” and knew she wanted to study perfumery. Still, becoming a nose is not exactly easy. McClain researched courses, and set her sights on the prestigious Grasse Institute of Perfumery, one of the few independent schools in the world. Only 12 students are accepted per year, and the application process is quite intense. As part of her final test, McClain met with perfumer Clément Gavarry, the nose behind such well-known creations as Prada Tendre and Tom Ford’s Black Violet. “We had a three-hour interview in which I had to smell hundreds of ingredients, articulate the scents, and separate them into different olfactory families,” she remembers. In the end, McClain was accepted, and migrated from her Brooklyn apartment to a converted dormitory in the French countryside of Grasse for a year of intense study. 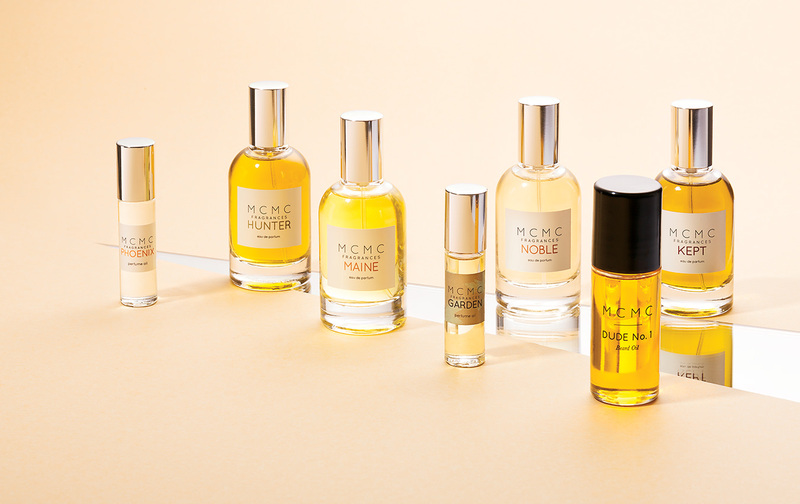 MCMC Fragrances formulas are stripped down to their most raw, bare elements, illuminated with just a handful of pure essences. Nestled among fields of lavender and mimosa, McClain filled her days with classes, mostly taught in English, but often slipping into intense debates in French, which McClain did not speak. Still, she caught on quickly, and studied hard for exams—the most rigorous of which entailed memorizing 500 natural ingredients. By inhaling each note, she learned to identify the minute differences between Bulgarian roses and Turkish roses. In her spare time, McClain worked on the concept for MCMC, deciding on the name (a play on her surname) and the basic DNA behind the venture. She knew it would be about “minimal formulas, an attachment to nature and a subdued colour palette [for packaging].” When she returned to Brooklyn in 2009, she launched her collection with three scents: Hunter, Noble (composed of Indian jasmine and Haitian vetiver), and Maine (with beach plum rose and local clary sage). She also convinced her younger sister, Katie, to come on as her business partner and handle everything from visuals to marketing to social media for the fledgling brand. Oddly enough, MCMC’s breakout moment wasn’t tied to a scent, but to beard oil. As a gift for her hirsute husband, José, McClain whipped up a soothing blend of natural oils, cedarwood, green coriander, and pink peppercorn. She called it Dude No. 1, and never intended to sell it. But once José started to wear it, his friends began to ask for it. McClain realized that lots of guys might appreciate the skin-softening tincture, so she officially added Dude No. 1 Beard Oil to her line in 2010. It quickly took off and became such an underground hit that McClain made an entire Dude range, complete with a candle and cologne. Notable collaborations have also raised the brand’s profile. In 2011, McClain teamed up with Brooklyn jewellery designer Katrina LaPenne for a hand-carved, sterling silver locket filled with solid perfume. In 2012, she enlisted Lance McGregor and Alan Iwamura to create a limited-edition run of 168 delicate glass vessels to house her Amara fragrance, a scent inspired by McClain’s trip to Cambodia with the non-profit charity Working for Children. This spring she partnered with art and accessories designer Caitlin Mociun on a customized fragrance reminiscent of Sicily, with Italian neroli flower, petit grain, and dreamy musk. Most recently, McClain joined forces with Talon jewellery designer Emily Hirsch on a perfumed amulet forged from silver, which debuted in September.